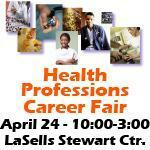 The Health Professions Career Fair will be held on Tuesday, April 24th from 10:00 am to 3:00 pm at the LaSells Stewart Center on the Oregon State University campus. Nearly 50 health professions schools from across the country will be attending to provide useful information for those preparing for a career in the health field. There will be a great deal of information for students no matter where they are in their academic career. First and second year students can explore health profession school options, start building networks for the future and get valuable advice and tips. For juniors, seniors and alumni there is the opportunity to learn about specific programs, collect application and financial aid information as well as get advice on the application process. To learn more about the Health Professions Career Fair, contact the College of Science at 541-737-4811 or science@oregonstate.edu Please visit the website to learn what schools will be represented and to learn tips that will help you get the most out of the fair.